The brief was to design and print promotional material for the Stenton Lecture: a prestigious history lecture that occurs annually at the University of Reading. The client asked for the design to reflect the momentous subject matter of the lecture. 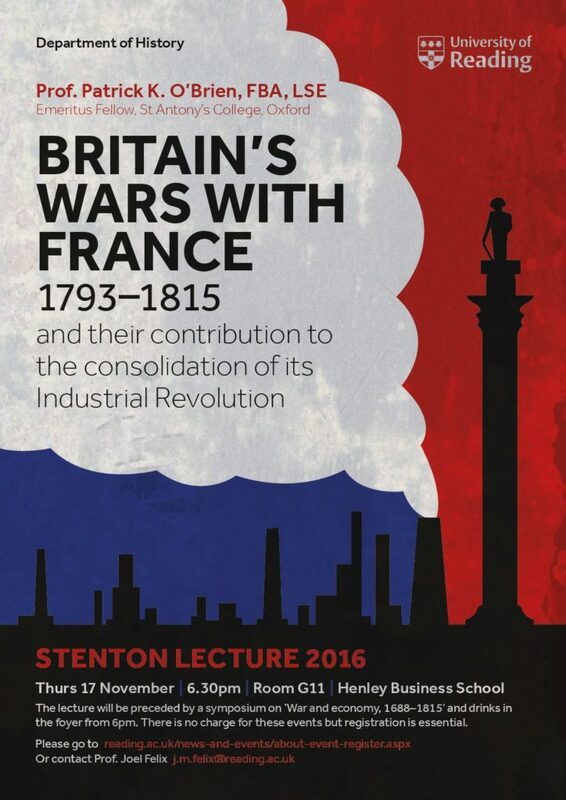 Britain’s wars with France 1793­­­–1815­­ and their contribution to the consolidation of its Industrial Revolution. The deliverables requested by the client included 10*A3 and 100*A4 colour posters. These were to be displayed around campus during the run up to the event. The aim was to engage a broader university audience and increase overall attendance by creating a conspicuous and thought provoking visual that promoted the topic as stimulating and exciting. Photography was not an option, as the technology did not yet exist during the Napoleonic wars. Appropriate high-res illustrations were scarce and only served to represent snap shots of particular battles: they did not encompass the overarching themes of the talk. There was little opportunity for typographic expression as the project had to adhere to university brand guidelines. The restrictions enforced by the poster templates pre-determined both layout and typographic styling. My response to these restraints was to create original vector artwork that uses colour as the dominant design feature. The concept was to pictorially/symbolically juxtapose the themes of war, nationalism, and industrialisation. White smoke erupting from an industrial chimney divides the red and blue areas of the French Tricolour flag and leads the eye towards the lengthy lecture title. The flag’s colours dominate the design: an emblematic reminder of the French contribution to Britain’s Industrial Revolution. The iconic Nelson statue towers over the cityscape, representing Britain’s naval dominance at the time. Fortuitously, red, white and blue are also the constituent colours of the Union flag: the posters is ambiguous, creating a sense of intrigue for prospective attendees. The strong use of red also helps to reinforce the UoR branding. The addition of an industrial texture overlay conveys the griminess of both war and coal fuelled factories. The poster can be understood and appreciated on multiple levels. At first glance (and from a distance), the viewer may only see the unmistakable design of the Tricolour and immediately understand the ‘French connection’. On closer inspection, other details are revealed which communicate a narrative that explicates the lecture title. Multiple viewing levels may result in the observer spending more time with the poster and potentially engaging with the information to a greater extent than a poster with a single viewing level. The design was well received by the history department and I was pleased to satisfy both the client (Prof. Joel Felix) and the key speaker (Prof. Patrick K. O’Brien). This would have accelerated the process significantly as it would avoid waiting for email responses and repeatedly having to make small copy alterations. This would have highlighted the importance of featuring the key speakers’ name in a more prominent position (and size) on the poster. I’ve learnt that there is a discrepancy between the appearance of opacity layers onscreen and in print. I was disappointed with the finished printed product because the overlaid texture printed much darker than it had appeared on screen. Similarly, the contrast between the red type on a black background was noticeably inferior in the print version. Since finishing this project I’ve learnt to enhance the density of printed black by underprinting 100% black with 50% of cyan, magenta and yellow. In hindsight, I used too many kinds of type variation on this poster. The light faces were intended to sit back in the hierarchy but they look too scrawny and lack presence on the page. If I were to re-do the poster, I’d be more judicious with methods of type differentiation and rely on scale, case, colour and italics before altering weight. At first I was dubious about adding a Nelson statue to the poster as I thought it might overcomplicate both the composition and concept: I only tried it out in order to appease the client. However, I see now that it is a crucial addition to the design, without which, there would be no reference to the British.